First thing I heard this morning was my husband chuckling as he climbed back in bed. I tiptoed down the hall and peeked into my daughter’s room. They were, indeed, snuggled up in her bed but it wasn’t all cuteness. I know when those two are plotting something and I smelled a rat…two mice actually. An eruption of giggles told me that I was right. A mass of messy hair pops up and screeches, “I don’t want to tell you” and then darts back under the covers in hysterics. The blankets wiggle all around as they whisper conference about what to do. Both heads pop out with wide grins. “I guess you aren’t interested in trying my homemade cinnamon rolls,” I say and walk away as they quickly converse and decide that sounds a bit better than sneaking cheese. This is my family. We are silly, quirky and sometimes ridiculous. I love my family more than anything in the world, but this is the first Thanksgiving that I have not hated. Thanksgiving has always felt like a big, fat lie. It has always left me feeling disappointed and sad. Growing up I didn’t understand why we couldn’t have the Thanksgiving of the movies. You know the one, right? It starts with a long drive as the family happily sings “over the river and through the woods to grandmothers house we go.” Or maybe it’s a long plane ride to some beautiful city that is blanketed in snow. Once there, you are greeted by smiling family that remark on how much you’ve grown and how much they miss you. The dining room is set with a large rectangular table with an elegant tablecloth, matching napkins with real silverware, platinum turkey place card holders with names written in calligraphy, gorgeous dishes in an assortment of fall colors and the centerpiece is a real cornucopia spilling out the most splendid fall produce. It would all make a Pottery Barn catalog jealous. A large assortment of friends and family would arrive bringing homemade goodies for all. Everyone would look beautiful and would be so excited to see each other. The head of the family would carve the turkey and make a speech about being thankful and everyone would be filled with the Thanksgiving spirit. Then the family would all do the dishes together and head outdoors for a family game of football. This is the Thanksgiving I’ve always been promised. This is what I’ve always imagined. But, for me, it’s a big lie. Growing up it went like this: drive 20 minutes to my grandparents’ house, hear how we never visit and how much they are disappointed in us, enjoy a slightly awkward meal and then watch TV. I thought that it would be like “Father of the Bride” and I’d marry into this amazing family that would host an elaborate Thanksgiving. It would be great. Nope. Didn’t happen. No big family Thanksgiving. After our wedding my parents divorced and my grandparents both died. Any hope I had of at least having a multi-generational Thanksgiving died with them. *Our first Thanksgiving in our tiny studio apartment included a turkey that only halfway cooked because the oven only halfway worked. Served bloody turkey and stuffing. Yum. *We were married Nov. 20, so we spent our first married Thanksgiving on honeymoon at Disneyland. We ended up getting room service because the crowds were terrible. Food was actually pretty good but cost like a million dollars. *When our boy was four-years-old, we spent the entire day fussing over him as he ran an increasingly higher fever. Debated about going to the E.R. Did not go, but then found out days later he had strep. Poor kid. Thanksgiving has never been horrible. Not even close. We have our little family and our health. I should be grateful. I should not be comparing and feeling sorry for myself. But I have spent so much time dreaming of that “perfect Thanksgiving” that real gratitude has eluded me. It’s the EXPECTATION that has been killing the day for me. After spending time last weekend at dance class dealing with letting go of expectations, I decided to put that into practice and let it ALL GO. I decided that I was going to embrace the day in whatever form it came. I didn’t even know when we would eat. Just figured when it was done we would eat. Guess what? Today was great. Really, really great. *The homemade cinnamon rolls and cranberry sauce (both firsts for me) turned out fabulous. *Ended up riding bikes with both kids in the street followed by a surprise visit from my mom. There is nothing like your mommas hug to brighten your day. *Watched the parade on my bed with some yummy cheese and salami. I was beaming with pride that my kids love the Broadway dances as much as I do. *Took another, longer bike ride with my boy to see the neighbors on “Christmas Street” putting up their decorations. We rode and yelled, “would you look at that” to each other. *A family hike that was highlighted by holding my husbands hand and seeing three frolicking deer. I had so many moments today that I just felt happy. I felt lightened of the burden that I’ve carried for so long. 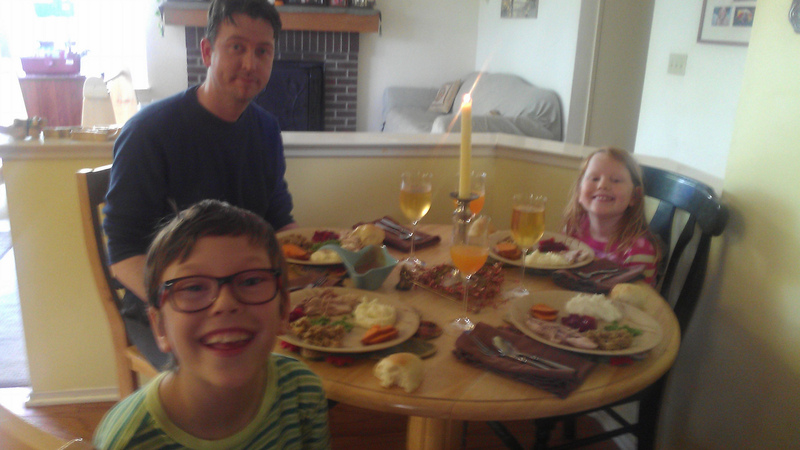 Today we had Thanksgiving our way and it was perfect. Here’s to letting more expectations go and just living my life. This entry was tagged Disneyland, Expectations, Family, Letting go, Love, Peace, Thanksgiving. Bookmark the permalink. So glad you had a great Thanksgiving! Mine have been intermittently disappointing over the years, too (no “happy TV family stuff” by a long shot) but yesterday was great, with my kids at a dear friend’s house with some of her extended family.